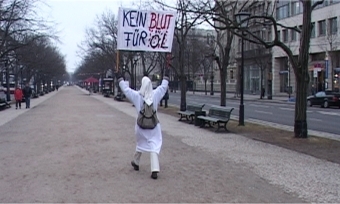 "The world is a permanent crisis of relationships"
January 2003, on the eve of the Iraq campaign of the coalition forces, a young coule tries to improvise a protest march heading to the American embassy with the motto "no blood for oil." David Sieveking was born in 1977 and studied Directing at the German Film and Television Academy Berlin from 2000-2007, during which time he worked as an editor, 1st AD and actor for film and television. In 2003, he participated in the Berlinale Talent Campus. A selection of his films includes: NACHDREH (short, 2000), A PROPOS DENNIS (doc, 2001), GANGA GUEST HOUSE (short, 2002), DIE AMERIKANISCHE BOTSCHAFT (short, 2003), MR. SINGH (2004, an episode of the feature ASYL), WILD MAN (short, 2006), SENEGALLEMAND (doc, 2007), DAVID WANTS TO FLY (doc, 2010), FORGET ME NOT (doc, 2012), and FAMILY SHOTS (doc, 2017).